When you go through the business glossary, it is common to encounter the popular and most-searched terms like selling concept and marketing concept. The questions that fascinates interviewers, business enthusiasts, scholars and students relate to how different they are from each other. The concepts of marketing concentrate on the immediate and future needs of buyers and focus on the methods that are identified for meeting the same. The phrase buyer is king can be fitfully awarded to the modern marketing concept. On the other hand, concept selling lays stress on the needs and requirements of sellers. One of the main points to reckon with in the world of marketing is that the selling concept makes a seller the one who rules the marketplace. Overall, the selling concept is related to the effort of turning products into cash through business transactions, while a marketing concept is related to the handling of customer needs via the product or service itself. These two often misconstrued concepts are divided by a very thin line wherein lies their meaning, processes, activities, management means, outlook, etc. This article has been designed to throw light on the various points of distinction related to marketing vs selling. Along with the marketing and selling difference, we will be discussing the modern concept of marketing and selling, meaning of selling and its features, definition of marketing and its features and so forth. Take a read. In what follows below, we have attempted to put the difference between selling and marketing in the form of a comparative chart. Selling concept pertains to a business notion. This concept points out that if consumers and businesses are left unattended, then ample sale of the product manufactured by the business will not take place. Marketing concept pertains to business orientation strategies and activities related to accomplishing organizational goals. It attains results by making an organization’s products better than those of rivals, specifically in terms of providing higher levels of customer satisfaction. Compelling the consumer's mind to understand and buy the goods and services of the firm following the selling concept. The marketing concept lays emphasis on directing the goods and services offered by the marketing company towards the consumer's mind. The selling concept gets initiated in the factory where the product is designed and developed. The target market serves as the starting point of the marketing concept where the marketers ae expected to gain knowledge about the prevailing market conditions and the demand of produced products via in-depth market research. The main focus of the selling concept deals with the product, its pricing, distribution and purchase by customers with the aim of improving upon overall sales figure. Sales maximization is the main goal of the selling concept. Customer needs are the main point of focus in the marketing concept. All efforts of creating brand awareness, creating the buzz, advertising as well as selling processes are directed towards attaining maximum customer satisfaction. The inside-out approach is adopted in the selling concept. The marketing concept holds ground in the outside-in approach. The main essence of the selling concept lies in the transfer of title and the possession of goods by the buyer. Here, the seller rules the market. Satisfaction of consumers serves to be the primary essence of the marketing concept. Here, the customer is king. Short term plans are made with a view of impacting customer purchase behaviour in a competitive market space or when the sales figures are not matching up with the above-capacity production of an organization. Long term plans in relation to product positioning, creating brand awareness, gaining customer loyalty, etc. make marketing a long-drawn process. The sales concept is volume oriented. It is profit oriented with profit maximization being the main goal of marketing. Heavy selling and promotion, along with the inclusion of all means for pushing a brand into the purchase list of buyers forms the goal of the selling concept. Selling efforts encompass luring, convincing, coaxing and attracting of customers to buy new goods and ideas in order to increase overall sales. Integrated marketing plans and strategies form the base of the marketing concept. In this concept, the strategies linked to a product’s marketing mix come into play – these are the 4 P’s of marketing - product, price, promotion and place (physical distribution). The price of products is dependent on the overall Cost of Production. The market determines the product pricing on the basis of various factors, including demand and supply. The marketing concept is typically a business idea that deals with the means and methods of placing a company’s products and services ahead of its rivals. It pertains to the production, delivery and communication of greater customer value and satisfaction to the target market. Most market concept examples would have some common threads running through them. These threads or marketing elements are integrated marketing, target market, profitability and customer needs. In general, the marketing concept begins with specific markets and their nature, lays stress on customer needs, understands and coordinates the activities the influence the buying habits of customers, and allows for profits by satisfying an organization’s customers. With the marketing concept being defined by different scholars, associations and marketers in different ways, it becomes important to understand the main idea that goes into answering the question, “What do you mean by marketing?” Given below are 5 main points that explain a company’s orientation towards the market place and guide their efforts towards concept marketing. 2.Fixing the price of products in a manner that is profitable to the company. 3.Emphasizing product benefits in ways that customers find specific products beneficial and worthy of their money. 4.Making the products easily available to customers. 5.Making the exchange of products with the customers for money an easy affair. The concept of market and marketing activities holds ground when a firm manages to attain its objective (both short and long term) of profit maximisation. This is made possible by identifying and working upon preferences and needs of current as well as prospective buyers. The core idea behind successful marketing concepts deals with the fulfilling of customer needs through the marketed product. Therefore, all marketing decisions taken by a company are targeted towards achieving maximum customer satisfaction. This feature of marketing concept states that all business activities should deal with the creation and satisfaction of customers. A lot of focus has to be laid on the needs and wants of consumers, along with the importance of making sound business profits. As all marketing decisions have to be made basis their impact on customers, business customers serve to be the guide in this business orientation concept. Regular and systematic programmes concerning marketing research are needed to keep marketers abreast of prevailing market conditions. Along with timely and accurate research metrics, innovation and creativity are necessary for matching up with the product requirements of customers. Up-to-date, adequate and in-depth knowledge of the business, its products and customers, ways of product distribution, effective communication channels with customers, etc. are important for successful market research activities and solutions. The marketing concept require a well-designed and goal-oriented approach towards marketing efforts. Earning of profits via the satisfaction of customers has to be the ultimate goal of any company planning its marketing strategies. The objectives and policies pertaining to marketing have to be defined precisely on the basis of this goal. Sound marketing planning help in injecting the best consumer-orientation features into total business systems; they act as guides for all organisational efforts as well. After the organisational and departmental objectives take shape, the organisational goals have to be aligned with the goals of organisational stakeholders. All activities and operations concerning different departments have to be coordinated for achieving the defined marketing objectives. The marketing mix has to be developed in the best fashion to bring about optimum customer satisfaction. The main aim of marketing concept should be the maximization of profits in the long run via complete satisfaction of all customers wants. Excellent communication skills – oral, written and creative – are a must. Public speaking and analytical thinking abilities. Good stress management and negotiation skills. Ability to learn about new technology and products. Creativity and attention to details. The selling concept deals with the exchange of a product for money with customers. Considered to be a subset of marketing, it is the final step in the entire marketing process. Selling is the end result of marketing wherever there is a need that can be offered. It is the last step in satisfying the intent to purchase that includes product positioning, brand creation, encouraging awareness, generation of buzz, assurance of customer loyalty, etc. Selling converts the demand for a product into profitable revenue following the exchange of products/ services. It serves as the logical conclusion of the process of value capturing for an organization. In most organizations, the functions and departments of marketing and selling are kept separate for the purpose of gaining operational effectiveness, profitability and excellence. In general, the selling functions need an autonomous team to perform crucial revenue generation processes of marketing in the most effective of ways. The selling activities undertaken by such teams have to be cost effective, targeted towards increasing the strategy execution pace, ridden with effective communication channels, etc. Having high-performing selling activities leads to better employee engagement that results in improved productivity and quality. Sound selling abilities of the autonomous team would lead to high customer value that results in higher profits. Sound knowledge of the products to be sold. Ability to educate and guide customers about newly launched products / ideas / perspectives. Ability to show potential returns on investment to customers from all walks of life. Fluency in different languages for creating connects with customers. Ability to assess and understand customer needs. Knowledge to handle/prevent objections coming from customers. Ability to demonstrate product offerings to customers. The selling concept states that in case businesses and consumers are left in isolation then it will not be possible for consumers to buy ample products as manufactured by companies. The selling concept has to be diligently applied when an organization is performing at 100% capacity (or more) and needs to sell its produce in the face of low market demand. In such scenarios, aggressive selling modes, promotional techniques and other selling concept characteristics have to be applied with the purpose of inducing customers to buy the produced goods. The various sales promotion means, such as advertising, personal selling, etc. have to be enforced. In a nutshell, modern selling concepts are led by the intent to sell whatever the company produces – be it through coaxing, convincing, persuading or luring buyers. These selling activities may or may not be targeted towards the goods desired by customers. Generation of profit through sales maximization is the main objective behind the selling concept. 1.The selling concept is basically a business concept that states that if businesses and consumers remain unattended, then it will not be possible to attain ample sale of the products manufactured by an organisation. On the other hand, the marketing concept is a type of business orientation that relates to the accomplishing of organisational goals by performing better than others and with a view of providing optimum customer satisfaction. 2.The selling concept is targeted towards compelling a consumer’s mind to buy the goods and services produced by a firm. Conversely, the marketing concept deals with activities that direct goods and services in a manner that influences the mind of customers. 3.The selling concept is initiated at the factory that becomes the starting point for all related activities. In the marketing concept, the initial point happens to be the target market from where the research for the entire market has to be conducted. 4.The selling concept places greater thrust to bring an organization’s existing products to the fore. However, the main emphasis of the marketing concept lies on customer needs. 5.While the selling concept depicts an inside-out perspective, the marketing concept showcases an outside-in perspective. 6.The selling concept implemented by modern organizations is reliant on the transfer of title/ possession of products from one to another. Conversely, the primary essence of the marketing concept is customer satisfaction. 7.The selling concept offers short-term business plans by taking sound positions and market share for a short period. A marketing concept, on the other hand, would deal with long-term business planning, lay focus of brand loyalty, concentrate on high switching costs, etc. 8.Sales maximisation serves to be the ultimate objective in the selling concept. Conversely, profit maximisation is the primary objective of the marketing concept. 9.The efforts comprising the selling concept incorporate promotion and persuasion. On the other hand, integrated marketing efforts form the crux of the marketing concept and includes different strategies linked to a product’s marketing mix. The market mix encompasses the product, price, promotion and place (physical distribution). 10.In the modern selling concepts, cost of production happens to be the main basis for determining product/service pricing. Conversely, in the marketing concept, the price of any product/ service is determined basis different forces dominating the market (or instance, demand and supply of product). As evident in the previous paras, the difference between marketing and selling follows a thin line and has to be understood well to gain maximum profits. 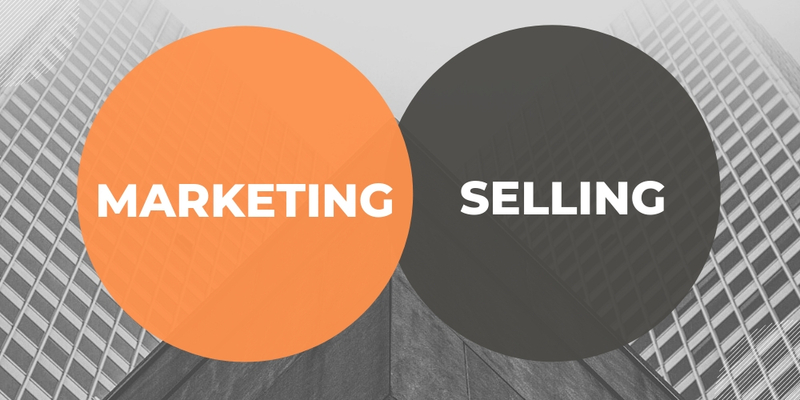 Even as the article flows through what is marketing concept, what is selling concept, difference between selling and marketing, comparison chart to differentiate between marketing and selling, etc. it can be observed that the marketing concept brackets a wider range of activities in comparison to the selling concept. This difference in selling and marketing arises because of the fact that selling is the final step of marketing concept. If you go through the slides of a marketing concepts ppt, you would find that selling is basically the promotion as well as transfer of product ownership from the seller to a buyer. In comparison, the marketing concept includes various activities such as the identification of the needs of customers, product designing and its development as per these wants, fixing of prices, persuading buyers with an intent of making them purchase the goods, etc. Do drop your comments about service marketing meaning, marketing and sales concept, marketing and selling concept example, etc. in the section below. In case you have any further inputs related to the concept of service marketing or the difference between selling and marketing then we will wait to hear from you.